Be the first to share your favorite memory, photo or story of William. This memorial page is dedicated for family, friends and future generations to celebrate the life of their loved one. 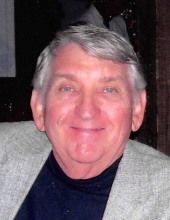 William Rufus Galloway, Jr., 86, went to be with his loving wife peacefully at Embrace Hospice House, Myrtle Beach on Wednesday, October 3, 2018. Bill was born in Fort Pierce Florida on May 23, 1932, the son of the late William Rufus Galloway, Sr. and Anna Dora Campbell Galloway. He graduated from Hemingway High School in 1950. Bill joined the United States Air Force upon graduation and served during the Korean War. He was stationed in Germany as an electronic aircraft technician and served his country until 1954. Upon completion of his military service he attended Clemson University where he graduated in 1958 with a degree in electrical engineering. After graduation, he joined Martin Marietta Corporation in Orlando Florida as an electrical engineer. His career spanned 32 years as an electrical engineer retiring as the director of the Pershing Ballistic Missile Program. Bill was an avid golfer in his senior years. He enjoyed golfing at as many courses as possible with his friends and wife Connie. His most beloved course was at his home in Maggy Valley, NC where he and his family created lifelong memories. He was the club champion on a number of occasions and had numerous “holes in one”. In his senior years, he often shot his age. Bill was preceded in death by his loving wife of 62 years, Connie Virginia Carter Galloway and his parents Rufus and Anna Dora Galloway. He is survived by his daughter Dianne Galloway Grace (Craig) of Celebration Florida; two grandchildren, Sarah and Cameron Grace; his brother James Alexander (Alex) Galloway and nieces Virginia (Van) Galloway Lesnett (Dirk) and Anna Galloway Currie (Ed). Funeral Service will be eleven o’clock, Monday morning, October 8, 2018, at Duncan Memorial United Methodist Church in Georgetown. Officiating will be the Rev. Dr. Dora Gafford. Burial will follow in Pennyroyal Memorial Gardens in Georgetown. The family will receive friends prior to the service on Monday, October 8, 2018 from ten til eleven o’clock at the Church Fellowship Hall. Sign a guest book at www.mayerfuneralhome.com. Memorial may be made to Duncan Memorial United Methodist Church, 901 Highmarket St., Georgetown, SC 29440 or Quilt of Valor Foundation , 2370 Windmill Way, Myrtle Beach, SC 29579. The Georgetown Chapel of Mayer Funeral Home is in charge of arrangements. To send flowers or a remembrance gift to the family of William Rufus Galloway, please visit our Tribute Store. "Email Address" would like to share the life celebration of William Rufus Galloway. Click on the "link" to go to share a favorite memory or leave a condolence message for the family.